An expectant father in Thailand's south is likely to miss the birth of his offspring. 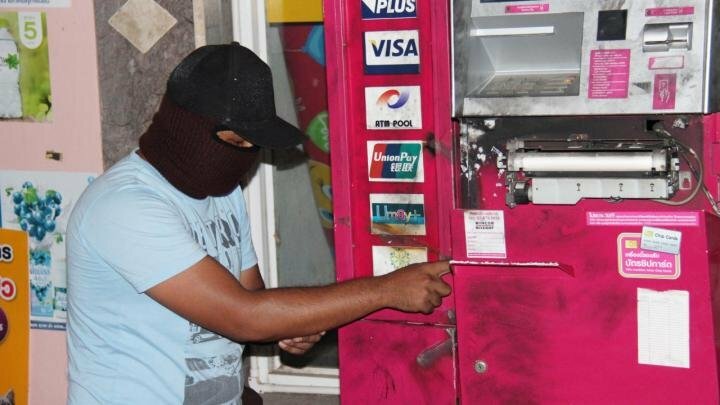 Kiatsak Chaibunkaew, 26, was disturbed by a shop owner last Saturday as he tried to use gas to penetrate an ATM near Petchkasem Road in Phattalung at around 4 am. He fled on his bike without getting and money. But police were soon on his case after they found the adapted motorcycle and tools in a couple of locations connected to the suspect. Under investigation - and unlike the ATM - he cracked. Kiatsak said he was in debt and his wife was just about to give birth. Police took him on a reenactment yesterday and detained him on charges of attempted theft at night and criminal damage. Phattalung cops quoted by Thai Rath said that Kiatsak was not a professional thief but he had gone equipped to commit the crime. Kiatsak had claimed earlier it was a spur of the moment thing. Thought that it was for free (30 baht), unless you want a private hospital. I doubt he would even open it from front with that gas cutter. He could always take her to a toilet in the local police station - no charge! Desperation will be obliterated after the election. I often rob a bank at the spur of the moment.